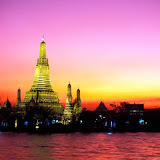 Tourist attractions, cultural attractions in the temple and shopping in Thailand. White is the dominant colour at Wat Mahathat, a welcome contrast to the colourful splendour of the nearby Grand Palace and one of the few temples in the Old City where worshippers still outnumber tourists. It was built during the Ayutthaya period, before the Rattanakosin area, where it is located, became the capital of Old Siam. Originally named Wat Salak it has undergone numerous name changes and renovations over the years – the latest being a renovation of the central viharn building where the main Buddha image is enshrined (this was still under way on our recent visit). The temple complex extends further into an array of alleys and smaller buildings that serve as the living quarters of the up to 200 monks who live here. Don’t feel like you’re intruding – you are most welcome, as this is where the International Meditation Center teaches Thai and Foreign visitors alike in vippassana (insight) meditation. An amulet market is situated near this 18th-century centre of the Mahanikai monastic sect and an important university of Buddhist teaching. On weekends, market stalls are set up on the grounds to complement the daily vendors of traditional medicines and herbal potions. Wat Mahathat is one temple in Bangkok where courses on Buddhism are given in English. Surrounded by perhaps the greatest concentration of Buddhist supply shops in Bangkok, Wat Suthat is one of the most important Buddhist centres in the kingdom and home to some excellent examples of bronze sculpture, a blend of Thai and Chinese-style mural art and a 14th-century Sukhothai period statue. The wat used to be the site for annual harvest ceremonies where brave men would swing up to great heights to catch a bag of gold coins in their teeth. However, the practice proved a bit too dangerous and was banned in the 1930s. Today the huge red structure, named the Giant Swing, still stands in front of the temple. 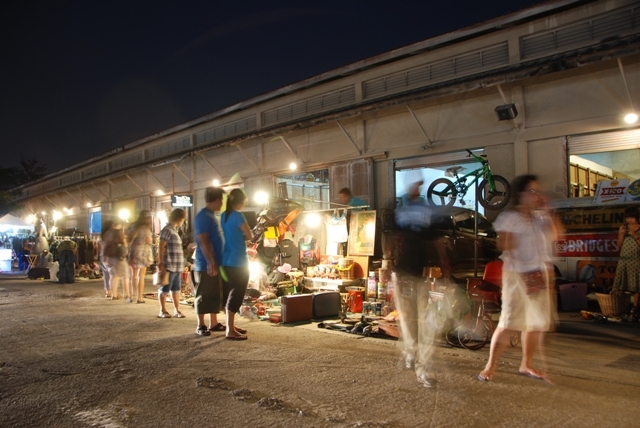 If the recent demolition of the Suan Lum Night Bazaar taught us anything, it’s make the most of the city’s distinctive shopping delights while you can. With this in mind, we strongly recommend you check out the latest Bangkok market to be getting talked about around the watercooler – Talad Rot Fai. While not the place to pick up your typical tourist clobber and souvenirs, this retro flea market just around the corner from Jatujak Weekend Market is still worth the trip, for its hipster vibes and photogenic setup as much as what’s flogged there. Since opening up last July word has spread. Hundreds of antique hunters and retro-mad dek neaw (teen hipsters) now flock to this plot on Saturday and Sunday evenings to browse and bargain for vintage collectibles, reproductions and fashions. And yet, the chance to pick up a beat up old Michelin Tyre sign, a vintage BMX, or a hip new wardrobe is only part of the appeal. 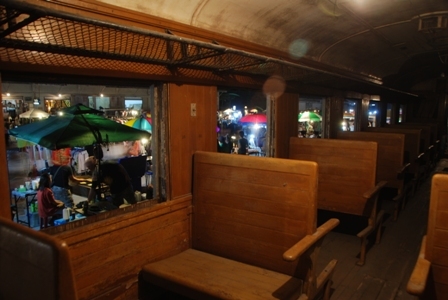 There’s also the novelty factor – flanking Talad Rot Fai, or the Train Market in English, is a row of decommissioned train carriages left there by the State Railway department. Thick with dust, poorly lit and just a bit spooky, these rusting deathtraps would be sealed off to the public in most countries, yet here you can stroll through the carriages at your leisure, even kick back inside them with a cold beer or rocket soda. Though it officially starts at 2pm, Talad Rot Fai takes a while to get going. Arrive before sundown and the place is a ghosttown. By 7pm though the VW Vans, Vespas and army utility vehicles have rocked up, the junk raided from homes and lofts across the city been splayed out under spotlights for the trendy throng’s viewing pleasure. Backing up the carboot side of things is Rod’s: a former railway warehouse turned 20th century antiques wonderland. 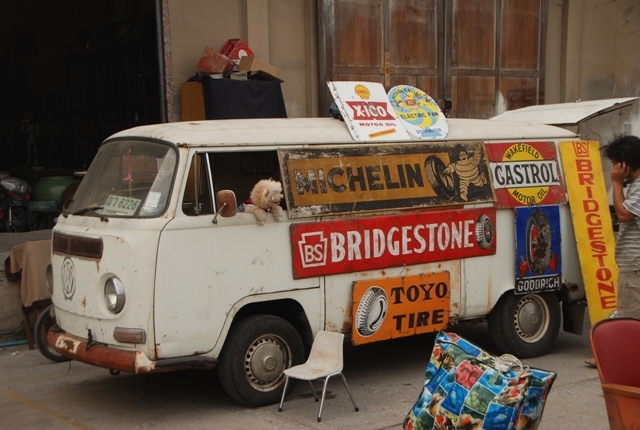 Classic cars, film projectors, gumball machines, Bakerlite phones, Chinese tiffin carriers, 1950s and turn-of-the century European furniture, are just a few of the legit pieces available to serious buyers. There are also lots of snacks and drinks stalls (retro-inflected, naturally), many of them operating out of customised VW vans. Others are located in the warehouses that flank Talad Rot Fai’s second area (from the main market, take a left after passing Rod’s warehouse and reaching the junction then take the next right). Even if you don’t want to dress like Southeast Asia’s answer to Joan Jett, or to do your pad out like the set for Happy Days, it all adds up to an enjoyable Saturday or Sunday evening out. Hop aboard, while you can. Catch the subway to Kamphaeng Phet station, exit onto Kamphaeng Phet Road then walk in the opposite direction to the intersection (away from Jatujak Market) for around 400 metres. After passing plant stores and bars, you’ll find Talad Rot Fai on your right. If coming by skytrain, we recommend getting off at Saphan Khwai and catching a tuk-tuk; most drivers in the area know it (whereas many taxi drivers don’t). These two parks situated not far from the mayhem of the weekend market offer some much-needed respite. 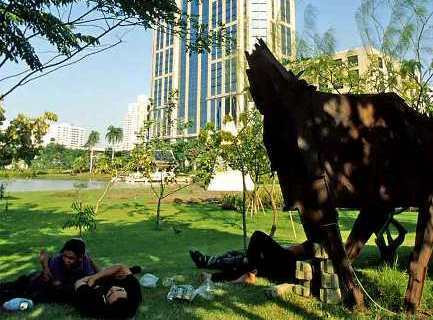 Jatujak Park hosts some art exhibits and a collection of old railway engines and ancient automobiles. Nearby, Queen Sirikit Park has a pretty botanical garden. 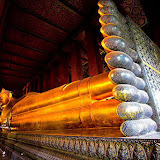 The Temple of the Reclining Buddha is the oldest and largest wat in Bangkok. 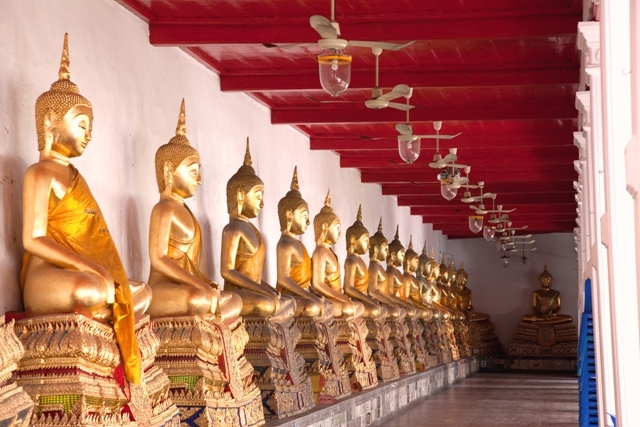 Originating in the 16th century, it houses the largest reclining Buddha statue in Thailand as well as the greatest number of Buddha images. Wat Po is also the centre for traditional Thai medicine and a learning centre for Thai massage, where you can both enjoy and learn this ancient healing art. The 45m-long statue depicts the Buddha entering nirvana and is impressive both for its size and the mother-of-pearl detail on the soles of the feet, a blueprint revealing the 108 auspicious signs of a genuine Buddha. Across the river from Wat Po is Wat Arun, or the Temple of the Dawn, one of the city’s most important and beguiling religious sites. Before being moved to Wat Phra Kaew, the Emerald Buddha was temporarily housed here. The five-towered structure is covered almost entirely in pieces of colourful porcelain and designed as a representation of Mount Mehru, the Khmer home of the gods. 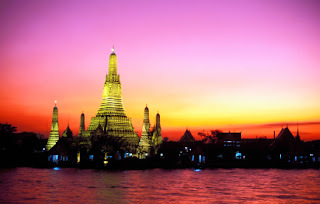 The temple is believed to have been named by Rama I on his first sunrise visit, but in contrast with its name, it is best visited at dusk when the setting sun forms a stunning backdrop. 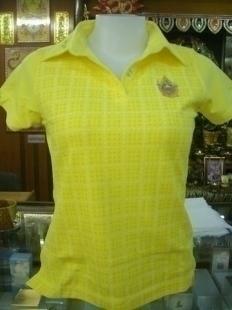 Every day has a corresponding colour in Thailand, and throngs of locals will don a yellow shirt to show their respects and celebrate the 80th birthday of the King, who was born on the yellow-themed Monday.